When I think of Cancer, I think of my family members that have expired and left this earth and took their life early. I guess I didn't really realize how many pets get cancer too. Veterinary Pet Insurance (VPI) has named November as Pet Cancer Awareness Month! This year is the fifth year that VPI works hard and diligent to raise awareness of Pet cancer and educating pet owners on resources and support. In the last couple of years VPI has reported the rise of pet cancer. VPI started their awareness in 2005 and since then have raised a large amount of money to aid in the help of pet cancer and pet cancer awareness. If you are a VPI policy holder and a pet owner, you are urged to contribute to this wonderful cause by buying a VPI limited-edition Pet Cancer Awareness dog collar. 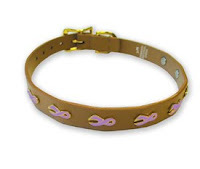 The beautiful collars with the Cancer Society logo is available in 4 sizes.You can also find a great cancer awareness pet accessories at Posh Puppy! All money raised by VPI during the month of November will be donated to the Animal Cancer Foundation (ACF). ACF is a non profit organization that works to help in the diagnosis, treatment and prevention of cancer in people and our pets. For more information on signs and symptoms of cancer in our four legged friends, talk to your vet or read here! However you help, just help this wonderful cause. Keep the turkey away from your little turkey! 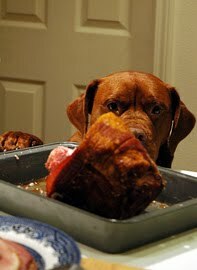 Oh... the smell of the turkey, pumpkin pie and that stuffing, all waiting for your consumption on Thanksgiving day... absolutely mouth watering... for us and for your furry little follower! This Thanksgiving, keep it drama free and make sure you take precautions to keep all safe, including your little "turkey". The day sometimes gets so busy and we are exhausted when it is all over we can make small little mistakes that could be deadly to our pets. Be smart this year and follow some basic steps to ensure safety! Don't feed your pet leftovers or give them little "samples" of what your whipping up. Dogs can get sick on high fat foods, and can develop Pancreatitis. This isn't a easy thing for your dog to get over. Watch the bones! I know we all think it is ok to give your dog the bones to chew on, but the truth is, they can break and splinter causing major internal damage to your pet. No chocolate! Chocolate contains Xanthine, a compound called theobromine. Chocolate can be fatal to your dog, so watch the pies and candy bowls! Bloating, not a fun thing to feel... Just like humans, dogs can get bloated, but the difference is, Bloat is a deadly condition that gives you a very limited amount of time to respond. Don't feed your dog when he is excited or there are alot of people still around, they tend to "gulp" down their food causing major stomach problems and there is no Alka Seltzer for them. All in all, be smart on Thanksgiving and keep your pets save and just be thankful we have them around. Dog Fashion designers have always given their best to their customers. They keep presenting their exclusive dog costume collection on all occasions. Creation of attractive, vibrant and exclusive dog costumes and dog fashion accessories needs lots of creativity and honest efforts. Dog fashion designers associated with popular dog fashion brands like Juicy Couture, Ed Hardy, and Christian Audigier are doing an excellent job in satisfying fashion and styling needs of dog owners. Juicy Couture founded by Pamela Skaist-Levy and Gela Nash-Taylor, has been a popular name in young casual wears and fashion accessories. Their wide fashion collection includes apparel for both men and women ranging from casual wears, sleepwear, to handbags, shoes, jewelry, fashion accessories, beauty products and fragrances. They have also contributed their unique fashion sense in designing dog costumes and accessories. Dog hoodies, dog tees, cardigans, dog coats, and dog collars designed by Juicy Couture are in great demand among dog owners. These are among the cutest gift you can gift to your lovely dog. They are made of excellent quality materials with excellent finish and great looks which can make any dog a point of attraction. Exclusive Christian Audigier and Ed Hardy collection for doggies doesn’t need any introduction. Every fashion enthusiast has something to say about the genius fashion designer who has crafted several wonderful pieces for global celebrities from Films, TV, Music and Sports world. You can spot several celebrities (like Britney Spears, Madonna, Shakira, Chris Brown, Paris Hilton, Mariah Carey and several others) dressed in a Christian Audigier outfit complementing with exclusive accessories designed by him. This iconic fashion designer is also dominating the dog fashion world with their wide collection of dog fashion products including dog collars, dog apparel, dog beds, dog carriers and many more. Dog owners love to shop dog fashion products designed by Christian Audigier and Ed Hardy. If you are also a proud dog owner and you love your dog like anything then you can have a look (if you haven’t witnessed the beauty of them yet) over the exclusive fashion products designed by them. It’s very easy to find them on reputed online dog boutiques. Happy Anniversary American Kennel Club! 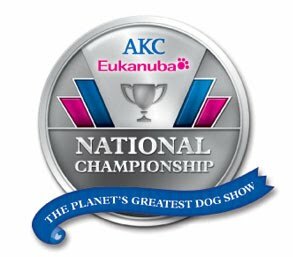 It’s that time again for the AKC/Eukanuba National Championship celebrating the American Kennel Club’s 125th Anniversary and this year will be waive its invitational format and championship points will be awarded. This long time watched event will be in Long Beach, California on December 12th and 13th at the Long Beach Convention & Entertainment Center. If you are unable to go in person you can watch this great event take place on Animal Planet or buy tickets online. Dogs from all over our 50 states and more than 70 countries will battle for the most prestigious award in the canine world! This great dog loving show will host many events like competing for the AKC National Champion, AKC Meet the Breeds, AKC National Obedience Invitational and the AKC Agility Invitational. Meet the AKC/Eukanuba National Champions. Congratulations again to the American Kennel Club for 125 years of great service to canine’s and their owners and for making all pet owners proud! I cannot wait to see who the winners will be this year! Providing a luxury life to their doggies is the primary motive of dog owners. Posh Puppy Boutique helps them in offering luxury life to their doggies. Roseville, CA (Press Release – 16 November, 2009) – PoshPuppyBoutique.com is an exclusive online dog boutique offering exclusive designer dog products to dog owners. The online store has been a hot favorite for numerous dog owners who want nothing less than the best for their dogs. Posh Puppy Boutique helps dog owners in providing luxurious life to their dog. Dog owners can give luxury living to their dogs by purchasing most exclusive designer dog costumes, magnificent dog collars, airlines approved dog carriers, comfortable beds for dog, and specially designed dog furniture from Posh Puppy Boutique. A majority of dog owners prefer to provide all the luxuries to their dogs. They treat their loving dogs just like their family members (in some cases even more than that), so they bring down everything in front of their doggies. Posh Puppy Boutique understands all luxury requirements of modern dogs, and presents a wide collection of dog fashion accessories and comfort good for them at their online dog fashion store. With customer centric services, secure ordering facility and freshness of stock (full of designer dog products), Posh Puppy Boutique has been the one stop destination for dog lovers. If you are also a proud dog owner and looking for something special to gift your dog, visit the online store of Posh Puppy Boutique at http://www.poshpuppyboutique.com, you will surely get something for your dog. Author Info: Posh Puppy Boutique is a renowned name in the world of modern pet boutiques. 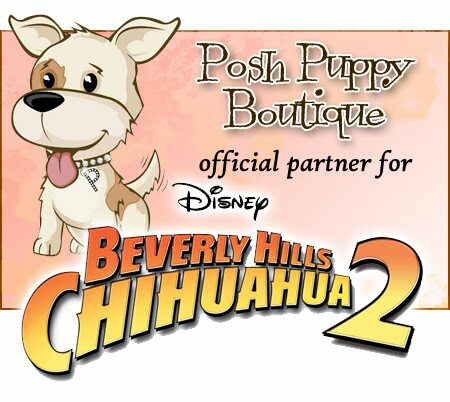 Posh Puppy Boutique is an authorized dealer of well-known brands such as Christian Audigier, Ed Hardy, Chrome Bones, Bone Digger and many more. Leading a luxury life is not only right of human beings. Nowadays, even your doggies can lead a luxury life just like you. Being a member of your family, your doggies also deserves same treatment like others. Nowadays, giving a luxury life to your doggies is very easy with help of online dog costumes and accessories stores. 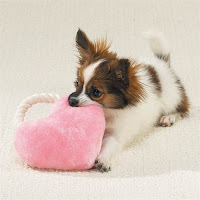 At online stores selling different kind of objects meant for your dogs, you have enough options to choose for your dog. You can select designer dog costumes specially designed for your doggies, or you can think of buying a luxury diamond studded dog collar to give distinguished look to your lovely dog. These online stores also offer different solutions for dog loving people on move. They can get luxury carriers for their dogs. The options also include airline approved carriers that means you can take your doggies with you when travelling. To give the most stylish look to your dog, you can select designer dog costumes. Online dog boutiques present wide collection of designer dog costumes from different prominent dog fashion designers at one place. Depending upon your choice, you can purchase them and give posh look to your dogs. Dog fashion designers present everything in the most exclusive form for your doggies. Dog boutiques present everything for your doggies ranging from designer dog costumes, to comfortable beds, stylish dog collars, dog carriers, and dog feeders. What else you need to help your dog in living a luxury life. To reduce your shopping burdens some prominent dog boutiques offer the facility of personalized shopping, where they have someone to assist you in shopping for designer dog products. In case, you are not able to find the products on online dog boutique’s website that you are looking for, you can take opt for personalized shopping. A customer centric salesperson will assist you in finding your desired product. Such personalized shopping services are offered for free by popular online dog boutiques. In summary, giving a luxury life to your loving dogs was never so easy. Nowadays, you don’t have to worry about anything required for your dog. As a sensible dog lover, you can find everything in place and give the best luxury life to your doggies. Posh Puppy Boutique is luxury dog boutique, carrying Dog clothing, dog carriers, dog toys, dog collars and more. 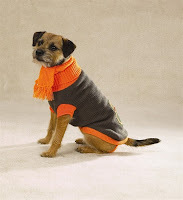 With great brand names like Juicy Couture Dog , Ed Hardy and other designer dog clothing. Good for you San Francisco! What a great place for pets! The Leanne B. Roberts Animal Care Center is the new home of The San Francisco/SPCA’s veterinary services! This is the new full service non profit Veterinary Hospital and Spay/Neuter Clinic, and Shelter Medicine Program and Feral Fix Program. We all know that the San Francisco SPCA has provided wonderful care to owners of pets who sometimes couldn’t afford veterinary services and those that need help financially and many times free care for the homeless animals or pets of the homeless people of San Francisco. Unfortunately that much care costs up to 1.5 million dollars in free vet care and cannot rely on the city to fund. The new facility, The Leanne Roberts Center has been funded 100% by private donors, those that love the city of San Francisco and those that truly love and care for animals. To make an appointment to visit the new center, you can call 415-554-3030. The center even offers free parking at Alabama and Treat Streets, and has free Wireless we access in the hospital lobby! If you are interested in donating, please do! With Saturday’s being such huge College Football days and everyone seems to be a fan of some team, it would be great to dress up your “favorite fan” in great pet team apparel. If you are a Auburn Tiger or Georgia Bulldog fan, today is the day to get a NCAA Auburn Dog Tee Shirt or a Georgia Personalize Dog Jersey. If you’re a Texas Longhorn fan, hurry to get a NCAA Texas Longhorns Dog Jersey! 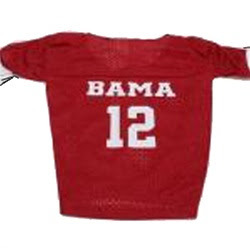 If you yell “ROLL TIDE ROLL” its time for the Alabama Dog Sweater! 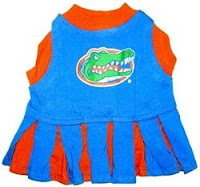 Gator fans (cannot leave those Florida fans out) ~ you need the Florida Dog Sweater. 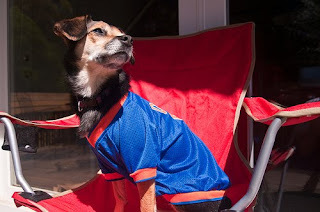 Whatever your “favorite college football team” is, you can get your dog matching attire and tailgate with him in style! Posh Puppy Boutique has a great variety of sports apparel for your dog, whether it be college football, pro football, basketball or baseball! You can find college football sweaters, team bowls, collars and even cheer outfits for your pet and all for great prices! Don’t TOY around with your pet’s toys! Sure! Toys are great for your dog! 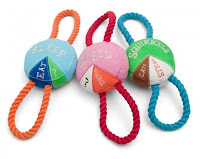 We all want to grab those “precious little squeaker” toys when we are at the grocery store, but there is more to buying a pet toy than just thinking it is cute. Make sure there are not small pieces on the toy that your dog can swallow or choke on. Be careful of toys with the “squeakers” as they can ingest quickly once they have gotten it out of the toy. Make sure that the toys is a "pet toy" if you want a "sqeaker", as not all "sqeaker's" are bad. Be careful of giving your dog one of the kid’s stuffed animals. It may cause confusion and you don’t know what kind of fiber it is made of. Choose a toy that fits your dog’s personality. If he is attached to your socks, chances are he will like a plush toy, if a “chewer”, a rubber toy may be best. If your dog is like mine and curious about everything, try and interactive toy. Allows you to play with your pet, and give a “reward” other than treats. Kongs: Kongs come in a large choice of sizes for dogs of all ages. They have Kongs for puppies and Kongs for senior dogs. This rubber toy has holes in both ends and can be stuffed with many yummy goodies, keeping your dog safely occupied! 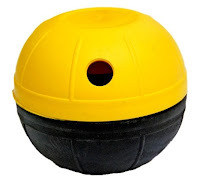 Nina Ottosson Dog Dizzy: Fill the ball with treats or dry kibble and let the dog have fun by working the Dizzy to retrieve the reward. The Dizzy is bottom weighted in an off center location which makes the ball to roll and twist in different directions but it always stops in the upright position. Personality Plush Toy:Personality Pull Plush Toy - Angel or Devil? Cats or Squirrels? Food hound or napper? Whatever your pups personality we have the perfect pull toy. Bright colors, a squeaky center, and thick rope pulls on either end ensure the perfect tug-of-war plush toy. Choose from three distinct personality types or collect them all. These toys are made of the best dog friendly materials. Whatever your choice of pet toys (and there are alot out there), make sure you pick a safe toy for your buddy! Trixie is Queen of the Day! 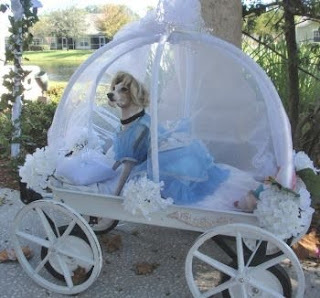 Congratulations to Trixie, a Italian Greyhound (toy breed) who won the Posh Puppy Boutique Halloween Photo contest! Trixie’s Mom, Judy said that Trixie is full of energy but only weighs 8 pds. Trixie enjoys playing, sleeping in the big bed, toilet paper, socks, sitting in laps and running in the dog park. See, dynomite does come in small packages! Trixie doesn’t like cold weather, but will be able to get her a beautiful new sweater with the $50.00 gift card that she won from Posh Puppy Boutique. Send your pictures to contest@poshpuppyboutique.com but make sure you read the rules first. Thank you for all who entered, we had over 150 entries and there are some precious little ones out there! Every month Posh Puppy will have a photo contest, so why not enter? Additional information for the monthly photo contest is available here! Heat up those Hot Dogs! When I say Hot Dog, I don’t mean the food, I mean, its time now to get those little Dachshunds or any dog warm with the cold weather almost here. Depending on where you live, it may already be as cold as can be! Just as we have Summer tips for our dogs, now we have winter tips for dogs. • Shelter Outside: Please make sure your dog house fits your dog appropriately. Make sure your dog can stand up, turn around but not too big that he or she loses heat. Make sure bedding is clean and dry and that your shelter is off the ground for protection from the elements. • Check dog paw pads for cuts and cracks from dry skin, check out these great winter boots! • Check your dogs ears, tail and feet for frostbite! If your dog is a outside dog, make sure his skin does not become red or gray. • Make sure you check food and water during the winter months. Make sure the water or food is not frozen. • Provide warmth for short haired dogs, this wonderful dog sweater will keep your pooch warm on those night walks! 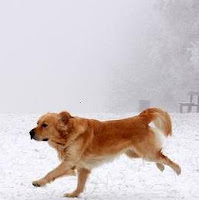 • Keep puppies and older dogs indoors and only outside for a short time as they are more fragile in the cold weather. • Keep your identification tags updated! • Please stay away from Antifreeze! Clean up spills as fast as you can! 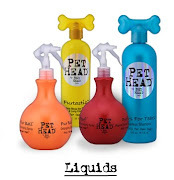 OR.. be on the safe side and find a pet friendly antifreeze, ones that contain propylene glycol. • Keep up grooming in the winter, as skin can become dry and itchy, try Fur Butter by Happy Tails, its great! Regular brushing keeps your dog's coat supple and prepared for the cold. However, when you bathe your pet, be sure to dry his coat thoroughly before allowing him outside. For more tips on keeping your pets safe, visit the ASPCA. There are many great cold weather items that you can get for your dog now, so try them out!